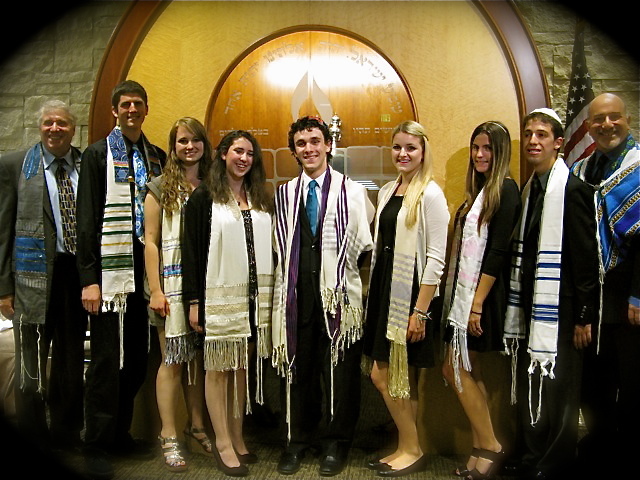 Seven Congregation Or Ami teenagers – Jessa Cameron, Libby Coufal, Nathan Fried, Ben Ginsburg, Dakota Keller, Marissa Meyer, and Peter Young – confirmed their connection to and their faith in Torah, the Jewish tradition, the Jewish people, and God. We asked each to answer questions arising out of the Jewish experiences, and then each student shared a few answers during the Confirmation service. Their answers represent a spectrum of belief and learning, sprinkled with poignant experiences in NFTY, at Camp and in synagogue. When have you ever felt close to God? Why has LOMPTY (our temple youth group) been so important in your Jewish life? Why is Israel important to you? What does Judaism have to offer the world that is so important and valuable? What do you particularly like about being Jewish? What prayer is most meaningful to you and why? Who is your Jewish role model and why? What are the most important Jewish values to you and why? How does Judaism value Tikkun Olam? Why has Camp (Newman, Kutz, JCA Shalom or others) been so meaningful to me. #1: Libby Coufal: What do you particularly like about being Jewish and why? Judaism is not only a religion to me, but also a way of life. My faith has helped shape me into the person I am today. I often find it easier to identify with other kids my age who are also Jewish because our morals and beliefs are similar. Through Jewish communities like Congregation Or Ami and BBYE, the B’nai Brith youth organization, I have made some of my closest friends, and consequently become even more involved with Judaism. Also, the ability to discuss questions openly like we did with Rabbi Kipnes in Confirmation Class has given me a more open mind about religion. Being Jewish can mean something different to everyone, yet we are all connected by a mutual faith that has withstood years of hardship and continues to be strong. #2: Nathan Fried: What do you believe about God? When have you ever felt close to God? I believe that God is watching everything we do whether it is moral or immoral. I also think that God can lead us to make a tough decision, that is very important. For example, God can help us as we struggle to decide whether or not we want to be friends with someone who is not friendly or who is doing dangerous things. In my challenging life, I have felt close to God about 3 to 4 times. The first time I felt close to God was at my Bar Mitzvah service. The second time I was close to God was when I needed some prayer to pass my driving test. Lastly, when I am driving alone, I feel close to God. #3: Benjamin Ginsburg: What do you believe about God? #4: Marissa Meyer: What do you particularly like about being Jewish? Judaism has played a major role throughout my life in shaping a code of ethics I live by. Through discussions at Confirmation class about current events supplemented by Jewish virtues, I have acquired a way of assessing situations and acting morally. In Confirmation, we have also talked about adversity, tolerance, and even death, in order to make such topics easier to face and deal with. Judaism is my way of life. #5: Jessa Cameron: Why has LoMPTY been so important in your Jewish life? Three years ago, I became a board member of LoMPTY, Light of My People Temple Youth, Congregation Or Ami’s high school youth group. Through LoMPTY, I have had the opportunity to teach others to be caring and compassionate. Having served as both LoMPTY’s secretary/historian and now the Religious and Cultural Vice President, I have enjoyed a variety of roles in shaping our youth group. I have helped create lively youth lounge nights, inspiring Jewish services, and meaningful social action projects that benefit local children. Through LoMPTY, I have been able to help a variety of different organizations and address global issues. I have also learned how to be a Jewish leader in our community, a skill I will take with me as my life moves forward and I graduate out of LoMPTY. #6: Nathan Fried: What prayer is most meaningful to you? The most meaningful prayer to me is the Hashkeevaynu, a prayer we sing every night at NFTY SoCal regional youth events, just before we go to bed. I feel that the Hashkeevaynu prayer protects all of us during the night. Another reason I like it is because we are all holding hands and singing a song that is so beautiful. After that we all pass a kiss on the cheek all the way around the closing circle. Lastly, the words of the Hashkeevaynu make it the perfect prayer to end the night. #7: Marissa Meyer: What prayer is most meaningful to you and why? My favorite prayer is the Hashkeveinu prayer. I used to recite it every night before bed with my mom. Now, it has become one of my favorite parts of NFTY weekends. The entire community stands in a huge circle, after a long day, arms around each other, voices joining together in harmony, singing “Shelter us beneath your wings, oh Adonai; guard us from all harmful things, oh Adonai. Keep us safe throughout the night, till we wake with morning’s light.” This prayer resonates with me by wrapping me in the feeling of peace, safety, and community as I drift off to sleep. It brings me closer with Judaism. #8: Benjamin Ginsburg: What do you particularly like about being Jewish? I see Judaism as the concept of “Yisrael” – struggling with God. Reform Judaism promotes and encourages a tradition of questioning, a constant reinterpretation of stories that happened centuries in the past yet continue to play out in our lives. I feel that my Jewish background allows me to be open-minded to other philosophies and ideas, while grounding me in a set of moral values that color my reaction to people and events. In addition, I feel a deep sense of pride to be part of a community and a people that are one of the most influential forces in human history. I see myself as a child of a great and ancient family of survivors, and I welcome the responsibility of bearing the torch and bringing honor upon my people. #9: Dakota Keller: Why Camp Kutz is so meaningful to me. The Union for Reform Judaism’s Kutz Camp in Warwick, New York was so meaningful for me because I was able to be around so many young Jewish teenagers who were all close to my age. Getting a chance to meet a whole group of new teenagers was really exciting. By the end of my whole summer experience there I considered everyone there as my second family. I know that the friendships that I made, I will keep them for the rest of my life. I was closest with the girls in my cabin. We all had different life stories that we all were able to share with each other. I consider all them to be sisters to me. I still talk to them as often I can. #10: Peter Young: Why traveling to Israel is so exciting for me? This summer I will be traveling to Israel for four weeks with NFTY, the North American Federation of Temple Youth. I am so excited to be in Israel for such a long period of time. This trip will allow me to experience everything Israel has to offer, which is truly incredible. While on my trip I hope to find out more about both my religion and the culture of Israeli Jews as it compares to the culture of Jews here in the United States. I have never been to Israel and do not really know what to expect, however, I do know that it will be the experience of a lifetime. #11: Benjamin Ginsburg: Why is JCA Shalom so important to you? Every time I go to Camp JCA Shalom in Malibu, I have the time of my life. There is something wonderful and magical that is born within a group of teenagers forced to live together for two or three weeks. The friendships I have formed at JCA have been some of the best, closest, and most powerful connections in my adolescent life. The support of such a tight-knit family produces a sort of group therapy effect; helping me conquer several emotional mountains that adolescence threw at me, and has done the same for everyone else in the group. One of my friends from this group recently told me that I am one of the most inspiring people he has ever met. The love that I have given and received at JCA has made me a happier and kinder person. #12: Dakota Keller: Why has LoMPTY been so important in your Jewish life? LoMPTY, Congregation Or Ami’s High School youth group, has been so important in my Jewish life because it gives me a chance to learn about my religion in a fun and memorable experience. I have been a part of LoMPTY for the past 3 years and I have seen how much stronger it has become over the years. We have involved more people and we are hosting more events every year. I have enjoyed LoMPTY very much especially because it has given me a chance to meet a ton of new people. This year I became a member of LoMPTY board. Being able to help plan this year’s events made me grow as a person. I gained new leadership skills that I never had before. #13: Marissa Meyer: Why has LOMPTY been so important in your Jewish life? I stand before you as a changed person, a changed person because of LoMPTY, Congregation Or Ami’s high school youth group. I cannot fully describe to you the impact it has had on my life, but I will try. LoMPTY gave me the opportunity to grow as a leader and an individual, planning events, running programs, and socializing with a variety of people. LoMPTY is a safe place with the most loving and welcoming community. We laugh, we joke, we talk, and no matter what I know that other LoMPTYites are there for me. LoMPTY has been one of the single most influential experiences in my life, giving me the most incredible friendships and the confidence within myself to be me. #14: Jessa Cameron: What prayer is most meaningful to you and why? Shalom Rav is my favorite prayer. Calling for peace, Shalom Rav embodies what we all hope for; a peaceful world. One day, I want to take a more active role in making our world a better place. This prayer reminds me that Judaism strives for peace and that one day we will all be singing songs of freedom. Also, the music of Shalom Rav is one of my favorite melodies. #15: Libby Coufal: What prayer is most meaningful to you and why? To me, the Mi Sheberach is the most meaningful prayer. When my sister Leah was younger, she sang in our temple’s youth choir. Every time we went to pick her up, she would sing the Mi Shebeirach in the car on the whole ride home. The melody became a favorite of mine from a young age. To me, a prayer to offer support and strength to those who need it is one of the most important prayers a person can say. Part of the belonging to a Jewish congregation is being intertwined with others, and offering support and a sense of community to those around you. The Mi Sheberach helps us do just that. #16: Jessa Cameron: How does Judaism value Tikkun Olam? Tikkun Olam, or fixing the world, is such an important part of Judaism and of my life. Being part of Congregation Or Ami, I have had the opportunity to help dozens of organization, from Operation Gratitude, which provides care packages to our American troops overseas, to the Gentle Barn, which offers a home and healing for abused animals. Being Jewish, I have seen how important it is to give back to our community. I love having the opportunity to embrace our Jewish values while helping others to have a better life. #17: Libby Coufal: How does Judaism value Tikkun Olam? Growing up at Congregation Or Ami, I have truly learned the value of Tikkun Olam. Tikkun Olam is repairing the world, and it seems to me that it is one of the most important aspects of Judaism. I have been exposed to countless opportunities within my faith to help others, whether it is serving food at the local soup kitchen, sponsoring a foster child each year, or what has become most important to my family – helping organize Mitzvah Day. It seems that every idea Judaism teaches comes back to this idea of repairing the world. We are constantly using our Jewish faith to make this world a better place. For me, Tikkun Olam is one of the most meaningful and tangible aspects of Judaism. #18: Peter Young: What prayer is most meaningful to you and why? When I was young, I was very lucky to have three grandmothers who I loved very much. Unfortunately, two of them passed away before I became a Bar Mitzvah. I think about them on a daily basis and miss them very much. This is why the Kaddish is the most meaningful prayer to me. When I recite Kaddish, I think about all the people I know who have died and I think about how much I miss them. Reciting the Kaddish helps me feel a connection to them. #19: Dakota Keller: What prayer is most meaningful to you and why? The Kaddish has been a very important prayer for me because it gives me a chance to grieve over the passing of my mother. When I recite the Kaddish, it allows me to reflect back on all the wonderful memories that I share with her. This prayer allows me to connect with G-d and my mom Felicia in different ways. It lets my brother Michael, my dad Barry and me to celebrate my mom’s life and what great things she did for us. Especially during these next few weeks, it will be really important to have her on my mind, because the one-year anniversary of her passing is coming up. May her memory be for a blessing. The comments by your seven confirmation teens were beautiful, and inspiring. I believe some of these young people will be heading toward rabbinical school. You and your educational staff must have done a wonderful job in their Jewish education.